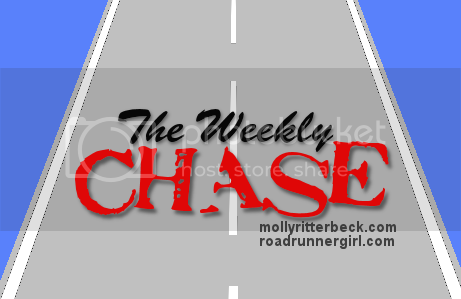 Road Runner Girl: The Weekly Chase #150! Happy Thanksgiving Week everyone!!! I hope you all have a wonderful and blessed Thanksgiving!!! I'm looking forward to spending lots of quality time with the family! So if I'm a little absent here on the blog and on social media please forgive me! I'm sure you will be doing the same! I had a great weekend! Friday was our last day of school until after Thanksgiving! We have this whole week off! The last day of school was a ton of fun because we had our school wide Thanksgiving Feast! My class dressed as Indians and were sooo cute! And a few of the teachers dressed up too! So much fun!!! After school Allison asked if I wanted Starbucks. Well of course I'm not gonna say no lol! So we headed to Starbucks...in our Indian shirts lol! The baristas loved it!!! Later that afternoon we rode along with Andy to some of his job sites. Can I brag on my engineer husband? He designed his first bridge and the final inspection (which the city said was the best final inspection they've ever had) was Friday. So he took me to see it (he's taken me there several times during the process). It was beautiful! So proud of my hubby! After looking at the bridge we went to our favorite spot to watch the sunset. Andy has a job site there too. So we checked on it and then got to walk and enjoy the sunset. We are so blessed to live here on the Gulf Coast! That night was pizza night with the family. I was running a long run the next day so of course we had to eat pizza! But my boys never complain! Saturday morning I ran a 10K with Jenny and her husband Eric! The weather was perfect! I'll tell you more about our run on Wednesday! After the run I had coffee with Jenny at her house. We talked most of the morning! So fun! The rest of the day was spent cleaning the house. Then we put up our Christmas tree and Christmas decorations! I normally wait until after Thanksgiving but we were all ready to put it up. That way we have more time to enjoy the tree! And since we are having Thanksgiving at Andy's sister's house I thought why not?! Cullen supervised the process! And thanks for your continued prayers! He seems to be getting better! We are still monitoring his urination. And trying to make sure he drinks enough water and eats his new food. Please continue to pray that he doesn't get blocked again! And I got to put on the star this year!!! Sunday morning I ran in cold weather! The wind was 12 mph with wind gusts that were crazy! And the real feel temperature was 35°!!! I am going to have to relearn how to dress for running in colder weather. My ears and hands were so cold! After my run I came in to warm up with some coffee. It was the perfect morning before church with Cullen in my lap, my Christmas coffee, and Christmas music playing in the background! Then we went to church. After church we went out to lunch with Kirstin, Jim, Maddy, and Nancy to Panera Bread! I got my favorite Chicken Caesar Salad and it was so yummy! Maddy came home with us for a play date. But first we stopped at Pet Smart to get Cullen a new toy since he's had such a traumatic week. Later that afternoon we headed to Starbucks and met Kirstin and Jim. Kirstin and I both had a free drink that was about to expire! Can't let that happen!!! I got a Chestnut Praline Latte since it was so cold outside! Andy got the Gingerbread Latte and thought it was really good. Then we went to Target....one of my other favorite places to go!!! Goal #1: Run every day! Yes! The streak is still going on! Goal #2: Roll, stretch, and ice daily. I missed a day this week of rolling. I had to wake up earlier and leave early for Hayden's field trip to New Orleans one day this week. I had enough time to run but I didn't roll. I had the intention of rolling when I got home but forgot! Goal #5: Run at least 1 run under 2 miles. Yes! Most of my runs last week were under 2 miles. I was trying to let my body recover some from back to back race weekends. Goal #6: Dye shirts for Thanksgiving Feast. Yes! I got these done and they were super cute! Goal #7: Get everything ready for Hayden's field trip on Thursday. Yes! And we had a blast on the field trip! Goal #6: Map out our shopping plan for Black Friday!!! It's a tradition every year that me and my husband go shopping on Black Friday! It's the only time of the year I can get him to shop! We always have so much fun together! And we get a lot of our Christmas shopping done on this day! Goal #7: Buy ingredients for the dishes I will be bringing for our Thanksgiving meal! We will be going to my sister-in-law's house for Thanksgiving. I need to buy the ingredients needed for the dishes I will be bringing. So that's it for the week! If I don't get to blog much this week I apologize! I hope you all have a wonderful Thanksgiving!!! QOTD: What goals are you chasing this week? Are you going out of town for Thanksgiving?